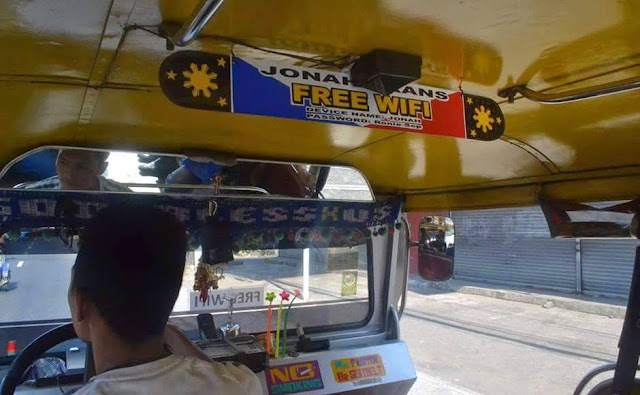 LEGAZPI CITY—Netizens here are abuzz over photos of a public utility jeepney here that offers free Wi-Fi Internet connectivity to passengers. The jeepney, which plies the Legazpi City-Daraga route, allows passengers to connect to a router on the dashboard via a username and password which are displayed behind the driver’s seat. It belongs to Jose and Jonah Cantilado of Dona Maria Subd., Barangay Tagas, Daraga, Albay, according to Gov. Joey Salceda. Netizens say the free Wi-Fi is making commuting in Albay more enjoyable and productive. In Bicol, several buses to and from Manila already offer free Wi-Fi connection, but it is rare for a jeepney to offer the service.